A new pilot combines hydrogen, microbes and biogas to perform energy storage. NREL bioreactor at power to gas pilot facility. 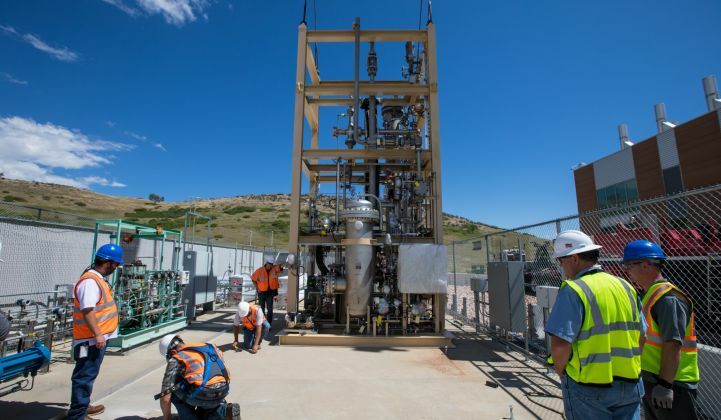 Last month, a team of researchers and engineers quietly installed a first-of-its-kind energy reactor on the campus of a government lab just west of Denver, Colorado. The device -- a 25-foot-tall, thin mass of industrial silver pipes and tanks -- is a test of a rather unusual method to store energy using microbes, hydrogen and clean electricity. Similar technology is being tested in pilot projects across Europe, but the reactor in Colorado is one of the only ones operating within the U.S. If the process, known as “power-to-gas” by those in the industry, is able to be deployed at a bigger scale and at a lower cost it could some day offer a solution to store large amounts of electricity produced by wind and solar over long periods of time. For now, it’s a novel experiment, at least in the U.S. “It’s pretty slick,” said Kevin Harrison, senior engineer for the National Renewable Energy Laboratory, describing the new reactor. NREL worked on the project in tandem with Southern California Gas Company and engineering firm Burns & McDonnell. The project works by taking electricity, which can come from excess wind and solar, to power an electrolyzer that splits water to make hydrogen. The hydrogen is then combined with carbon dioxide and fed into a reactor filled with microbes. On NREL’s campus, the gases are added to the bottom of the reactor, and as they float to the top, paddles that are spinning slowly break them up. The hardest part is breaking up the bubbles so that they’re small enough for the bugs to eat them, explained Harrison. The microbes, which aren’t genetically modified, wake up and start consuming the gases at around 120 degrees Fahrenheit. After eating the gases, they spit out methane, commonly called biogas. The team chose these microbes partly because they can do the process over and over again. “They’re tough bugs,” noted Harrison. The biogas can be used like regular fossil-fuel-based natural gas to heat homes and businesses. It can also go directly into the natural gas pipeline network without needing to be cleaned up, researchers say. Gas utility Southern California Gas Company, a subsidiary of Sempra Energy, has a keen interest in new ways to produce and use biogas. It’s also the same company that suffered a massive gas leak in late 2015, which is thought to be the largest methane leak in U.S. history. New technology could help the gas giant be more environmentally friendly, and the technology has promise to make wind and solar more competitive. The idea is that electricity for power-to-gas projects would come from a solar plant or a wind farm when they’re producing excess low cost energy -- during a windy night or a sunny afternoon, for example. Instead of wasting that electricity, it could be stored for weeks or even months and used at a later date in the form of hydrogen or biogas. Other power-to-gas projects eschew the use of microbes. A demonstration project on the University of California, Irvine campus, also supported by SoCalGas, takes excess solar energy from solar panels and powers a 60-kilowatt electrolyzer to make hydrogen. The hydrogen can be piped into the existing natural gas infrastructure. Jack Brouwer, associate professor of mechanical and aerospace engineering at UC-Irvine, said the demo project on the university campus suggests that power-to-gas tech can be used to provide very fast ramp rates, potentially helping out when a cloud passes over solar panels, for example. It also suggests that storing energy as hydrogen could be cheaper than batteries on a large scale and can be used to store energy seasonally. “The energy could be produced in January and used in June,” said Brouwer. Batteries aren’t efficient enough to do that economically, he argued. Another benefit of hydrogen is that hydrogen tanks can be moved around and used to power fuel cells to produce electricity or to power a vehicle. Projects in Europe are focused on using power-to-gas tech to couple power generation infrastructure and the transportation sector. There are already 70 projects operating in Europe, many of them in Germany, according to the industry group the European Power to Gas Platform. Europe has an interest in hydrogen as a natural-gas substitute, as well as to balance the grid and make it more flexible, said Claire Curry, head of applied research at Bloomberg New Energy Finance. With U.S. natural gas so cheap and plentiful, and without stricter carbon reduction regulations, the U.S. has less incentive to charge ahead with power-to-gas projects. “In a nutshell, it's not very far along in the U.S.,” said Curry. For now, the technology on the NREL campus is being done on a small scale. The team sized the reactor in the 100- to 200-kilowatt range, and it can accept between 2.5 and 5 kilograms of hydrogen per hour out of the electrolyzer. At that size, and because it’s a one-off project, “The reactor cost more than we’d hoped,” said Harrison, who declined to give the overall cost. But the researchers hope to eventually build bigger versions sized at 1 or 2 megawatts, or even 20 megawatts. Some states, including California, Nevada and Arizona, could have more incentive to birth these projects. A Lawrence Berkeley National Lab study found that by 2025, up to 7,800 gigawatt-hours of excess solar and wind energy could be curtailed in California. If that electricity were converted to biogas, it could heat up to 370,000 homes.